In today’s global world, most companies are recruiting a diverse team of high caliber professionals. These individuals need to communicate effectively with colleagues within the organization as well as with the outside world. It is important to create a positive impression right from the first words that you speak. 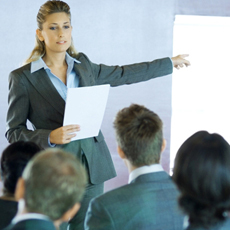 There is an increasing demand to give presentations in person and/or via phone, Skype or video conferencing. It is crucial that you are understood accurately and that your message is correctly received. If you have an accent or you do not articulate clearly, your speech may interfere with your ability to achieve your professional goals and you may come across as being less knowledgeable than you are. Listeners may become impatient with your accent or your failure to communicate clearly and “tune out” so that they are not focusing on the content of your message. There are fewer opportunities for promotion and salary increases as your professional skills are masked by your inability to communicate clearly and to project credibility and confidence. Self-consciousness may prevent you from sharing your ideas and showing what you are capable of accomplishing. The way that you use your voice can also affect your professional image. If you speak too fast, too soft, or constantly use “fillers” such as “um”, “like”, “you know”, or “so”, it is distracting to the listener and it undermines the impact of your message. The use of planned pausing and phrasing and the ability to emphasize words for meaning allows you to project confidence and professionalism. Your ideas may be well thought out and powerful, but if the delivery is not commensurate with your skill level, you will not be heard. Reducing a foreign or regional accent, working on speech improvement, and improving your corporate speech skills with a licensed Speech Pathologist can have a very important impact on your career. It can allow you to speak with clarity and precision and to project a positive image for you and your company. Whether you are an executive preparing for an important speech, a manager perfecting your communication and presentation skills, or an employee wishing to improve the way that you speak, we have a program that’s right for you. Our method of speech and voice improvement is easy, practical, and effective. You will hear self-improvement with every session. We take pride in improving the way that people speak and in helping them to achieve their professional goals. In our global economic environment, don’t let your speech be a hindrance. Professional communication training may also benefit employees who will be coming to the US from foreign countries. Skype sessions can be scheduled in advance of their arrival so that they have a head start.